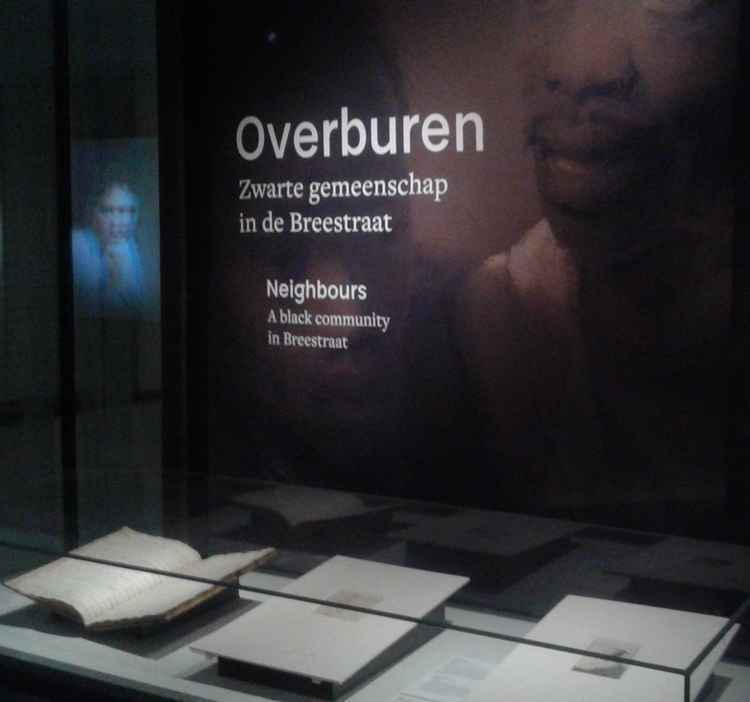 On December 7, 2018 the exhibition Rembrandt Privé [Rembrandt Privately] opened at the city archives of Amsterdam. In an earlier post on my blog I mentioned the project RemDoc – Rembrandt Documentation which offers a searchable database with images, transcriptions and many English translations of seventeenth-century documents pertaining to Rembrandt van Rijn (1606-1669). The exhibit show documents held at the Stadsarchief Amsterdam, the largest municipal archive in the Netherlands, some original works by Rembrandt, a number of maps and the chance to gain access to augmented reality around the documents using a tablet. The legal nature of many documents will soon become clear in this post. I started to admire Rembrandt already as a child. His paintings, drawings and etchings are so much alive with people. Paintings from the Dutch Golden Age helped shaping my perceptions of the seventeenth century. I was soon aware of the many decisive turns in Rembrandt’s life. The way he portrayed people both in sorrow and joy, and the dark hours of his own life offered a healthy antidote to viewing the Dutch Republic in too much sunlight. The catalogue of the major Rembrandt exposition in Amsterdam in 1969 was a book I have seen many times. It often referred to historical documents about Rembrandt and his works. Reading about somebody in a book is one thing, seeing the works of an artist in museums adds much to it, but somehow having the documents in front of you stirs the imagination even more. The Rembrandt Documentation project of the Huygens Institute in Amsterdam and the Radboud University Nijmegen gives you online access to many thousand documents. There was an older work, Die Urkunden über Rembrandt (1575-1721) by C. Hofstede de Groot (The Hague 1906; online, Universität Heidelberg) with transcriptions and commentaries for nearly 500 documents, followed by W.L. Strauss and M. van der Meulen, The Rembrandt Documents (New York 1979) and M. Roscam Abbing, Rembrandt 2006, II: New Rembrandt Documents (Leiden 2006). The online project has a wider time range, 1424 to 1799, and offers much more documents, and also references about Rembrandt in art literature. Sometimes Hofstede de Groot did not record texts completely. Commentaries can be very different and convincing explanations no longer missing. An example: Hofstede de Groot gave a large extract from an attestatio de vita from July 26, 1632 (no. 25, p. 24-25; RemDoc, no. 4399) made by a notary inquiring about Rembrandt’s health, but the reason for this inquiry was not clear to Hofstede de Groot. In 1979 it became clear it had to do with a rent subscribed to by one hundred citizens with the stipulation the full sum would be paid back to the longest living subscriber. The exhibit at the city archive shows a selection of documents around a number of themes and events in Rembrandt’s life. Often two documents are shown, with either a print next to them or an image of a painting in the background, most of them from the collections of the Rijksmuseum and the Rembrandthuis. With the tablet you can focus on a document and start a short podcast about the document or documents. 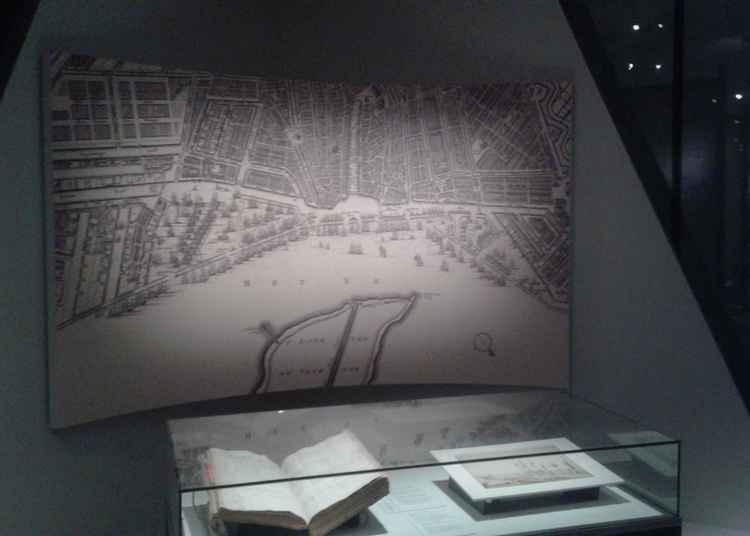 Often you will see a seventeenth-century map in the background showing you the exact location in the inner city of Amsterdam. The image to the left centers on a document about the execution of Elsje Christiaens, a Danish servant convicted for murder hanging at the display gallows in 1664 on the other side of the IJ, the estuary to the north of Amsterdam. Rembrandt often made sketches in this region. He drawed this young woman twice. The exhibition shows some familiar documents, and although I had already some expectations, the legal nature of many documents is indeed striking. To mention just a few of them, the betrothal of Rembrandt and his first wife Saskia van Uijlenburgh in 1634, an ecclesiastical procedure about his later mistress Geertje, some testaments, the inventory of his bankruptcy in 1656, and the inventory of his house after his death in 1669 are all legal documents. The death-bed inventory of Rembrandt’s house in 1669 is rather special. It belongs to documents more or less damaged by the 1762 fire in the city hall. Several documents have now been restored and digitized. Until now the transcriptions of this document in RemDoc (no. 13471; Hofstede de Groot, no. 306) could only be incomplete. It is a reminder that a historical state of affairs can change indeed. Illegible or missing words can become clear. In the case mentioned above a document which seemed inexplicable can be studied anew, placed in a context and yield new information. The readability of old Dutch documents was the theme in a post I wrote earlier in 2018. I proposed to everyone wanting to learn online to decipher Dutch documents from the seventeenth century to start with the documents about Rembrandt. As an example I showed an image of an obligation Rembrandt had got into for the purchase in 1639 of his house in the Sint Anthoniebreesteeg for which he had failed in 1653 to pay four years of interest (RemDoc no. 4628). Even if not for all documents images and an English translation is available, a fair number of archival records can be used to gain also palaeographical skills. Among the archival records on display I want to single out two documents. The first is a complaint from the Portuguese merchant Diego d’Andrada in 1654 about a portrait of a young lady Rembrandt had made for him (RemDoc, no. 1661) with clauses about the way Rembrandt was going to act to fulfill the wishes in accordance with the regulations of the painters guild. The second document involved also the presence of Portuguese merchants in Amsterdam, the burial of Francisco d’Angola in 1659 who had lived in the same street with Selijelij Krablije. Rembrandt could meet in the very street where he lived black people who lived as servants in the houses of Portuguese merchants. In Amsterdam it was forbidden to have slaves, but one can assume in some cases such servants were in fact slaves. Amsterdam had become in the seventeenth century one of Europe’s most important financial and trade centers. You might encounter anyone and anything, and thus Rembrandt’s world stretched far beyond Holland. The Stadsarchief Amsterdam is rightly famous for its digitization service. Some 30 million images of archival records are currently available online. Indexes exist for a steadily growing number of record series, and in most cases they lead you to digital images, too. The ondertrouwregisters (betrothal registers) are probably the most praised record series of the municipal archive, because uniquely for this kind of resource the Amsterdam records often contain additional information about the partners, their professions, origin and family. In 1906 Hofstede de Groot noted in the acknowledgements he had not used himself the notarial registers of Amsterdam, because this rich resource had not yet been adequately inventoried. He had mostly to rely on the transcriptions and editions of the people who had gained access to them thanks to the guidance of archivists. It is one thing to have now at your computer screen full access to digitized images of these registers using the finding aid (toegang 5075), but another thing to find quickly relevant acts. Here the crowdsourcing project Alle Amsterdamse Akten steps in which aims to digitize and create indexes for a staggering volume of notarial registers, good for 3,5 linear kilometer in 700 cupboards. The project overview gives a current number of nearly six million digitized pages, some 680 volunteers at the Dutch transcribing platform Vele Handen [Many Hands] and 267,000 documents. There are more than ten thousand registers from 731 notaries in the Early Modern period. The website contains special dossiers about six themes, among them Rembrandt and also slavery with highlights among the notarial acts, some of them newly found, others already known. After free registration you can start searching in the notarial registers from Amsterdam at the website Notarieel Archief Amsterdam. You can search for descriptions, type of act, first names and surnames for two persons, location, day, month and year, or choose a particular notary. When searching for Rembrandt van Rhijn you will immediately get a choice of variant spellings in a dropdown menu, both for Rembran(d)(t) and R(h)ijn. At this point I can no longer hide the fact that the exhibit can be visited in a Dutch and English version, but the other websites of the Stadsarchief Amsterdam are completely in Dutch. The press kit for the exhibit in four languages and the display texts for the documents are the exceptions, but the tablet scripts and transcriptions are only available online in Dutch. There is a strong case to add at least a search interface in one other language. It is some solace to be able to download the 1998 repertory of notaries in Amsterdam between 1524 and 1810 by A.J. Bosma. Earlier on an overview had been created of more than 5000 notarial acts in cases of gross avery between 1700 and 1810, damage to ships in emergency situations, an important resource next to an index on these cases of maritime law heard by a special court. I wrote a paragraph about these verdicts in an earlier post. It seems wise to see Rembrandt not in isolation. John Michael Montias (1928-2005) was an economic historian who became an art historian focusing on the social context of art. He found and transcribed lots of Early Modern probate inventories mentioning works of art which can be searched in the Montias database of the Frick Museum, New York. The Meertens Institute for Dutch Ethnology has created the Boedelbank, a database with Dutch probate inventories from four regions seen as a resource for the history of material culture. In 1989 Montias published Vermeer and his milieu. A web of social history, translated into Dutch as Vermeer en zijn milieu (Amsterdam 1993). Over the years Montias had traced some 450 documents in seventeen Dutch and Belgian archives – not only in Delft! – with direct and indirect about information about Vermeer, his family and people associated with him. The Dutch edition contains as an appendix (pp. 331-403) an enlarged version of the list of documents with a number of full transcriptions. The number of documents for Vermeer is definitely lower than for Rembrandt. Even if such documents do not allow for strict conclusions about the content of his art works, they enormously raise the awareness about the multiple contexts of Dutch art in the seventeenth century. In the face of an ocean of specialized art literature about Rembrandt and Vermeer the point I liked to make here is not only the legal nature of many archival records in the Amsterdam exhibition, but also the presence of many other persons in these documents. Rembrandt and Vermeer were supreme masters in portraying people who you seem to know and understand in an uncanny way. The Dutch historian Geert Mak wrote a book about the Six family [De levens van Jan Six. Een familiegeschiedenis, 2016; The many lives of Jan Six. A portrait of an Amsterdam dynasty, 2017], a merchant dynasty with Jan Six at its very heart, a friend of Rembrandt, portrayed twice by him. The painting is still owned by his descendants. Viewing someone in his familiar surroundings or in the streets of his hometown is also a metaphor for viewing law not as an isolated element of society, but vitally connected to its utmost veins. Finding and recreating such connections is surely challenging, but searching for a subject in vivo is more rewarding and revealing than staying content with results in a supposedly detached laboratory. At the end of 2018 I would almost say: Keep calm and study legal history! This entry was posted in Archives, Exhibitions and tagged Amsterdam, Art, Colonial history, Early Modern history, Legal history, Netherlands, Palaeography, Slavery, Social history on December 30, 2018 by rechtsgeschiedenis. A few weeks ago I visited an exhibition with a title which I had associated first of all with law and justice, Cold Cases Amersfoort at Museum Flehite in Amersfoort. Even its subtitle Oude skeletten, nieuwe ontdekkingen [Old skeletons, new discoveries] did not turn me away from making the short journey by train from Utrecht to the lovely small city of Amersfoort. The exhibition was certainly not exactly what I had in mind, but in fact the very difference between my expectations and the actual exhibition made me think. While walking in beautiful old Amersfoort and visiting two other historic locations it seemed these three locations each bring their own perspective. In a way this post is about some of the metaphors we often use almost without noticing them. In the light of a sunny Saturday afternoon they became visible again. Cold cases, these words worked for me like a trigger. You might associate it first with reconstructing and analyzing cases, but here archaeologists worked with some five hundred human skeletons, a reminder that however abstract analysis can become you meet here the physical remains of people who walked on the surface of the earth, just as we do now. These skeletons were found during the excavations of cemeteries on four locations, some of them attached to monasteries. Some excavations took place a few decades ago, but with new technical equipment the skeletons can now be studied in far greater depth than a generation ago. Think only about the way tiny fragments containing DNA can now be analysed in a way simply impossible twenty years ago. In this respect the title Cold cases is certainly aptly chosen. In this exhibition you do not just have complete and incomplete skeletons. There is general information, there are showcases about individuals whose skeleton in some way can tell us vital information about their life. There is for example attention for the way you can determine gender and age, or detect traces of diseases. Some skeletons, in particular skulls, show the signs of accidents or violence, others are marked by the deadly effects of a disease. Syphilis came to Europe in the early sixteenth century, and its harmful presence is clearly visible once you know the tell-tale symptoms. Perhaps the most telling part of the exhibition is the room showing the reconstruction of the face of a young girl. She has received the nickname “The Girl with the Ear Clamp” because of the iron clamp used for head caps found in her grave. A lot of techniques and skills are necessary to reach the final result, a startling lifelike face. In order to bring especially young visitors closer to the work done to achieve such results part of the exhibition is a kind of study room with a laboratory. Every Wednesday an archaeologist can give you more explanations about the exhibition and the way archaeologists can now approach human remains. On other days a story-teller takes you back to late medieval Amersfoort, and on Sunday afternoons you can meet the challenge to reconstruct yourself a skeleton. When I left a bit earlier than expected the exhibition at Museum Flehite I had enough time to visit two other historic locations. I went first to a museum housed in the remaining buildings of an Early Modern hospital, the Sint Pieters en Bloklandsgasthuis at the Westsingel. In fact it is the only still existing one of its kind in my country. The chapel built around 1500 and the men’s hall from 1536 have survived the centuries. On weekdays visitor can meet actors dressed as inhabitants who re-enact some inhabitants in the year 1907, just before the removal to new premises at Achter Davidshof. 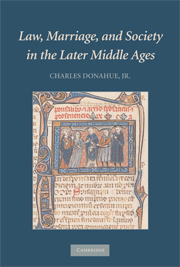 The choice to play out this situation with as its surroundings the situation of the nineteenth century might seem startling, but it would indeed be more difficult to stage people from the sixteenth century. The actors tell the visitors they do not yet know the new place and that they are excited and anxious about their new housing. Instead of telling in ample detail about their daily life, as indicated in an ordinance you can read in the main hall, they prefigure almost the way a historian approaches the past. You do not know what is around the corner of what someone will day or do in a few moments, unless a lifetime of patient attention, study and reflection over the years has taught you something fundamental about people living in particular times and circumstances. My third visit on this afternoon in August was to the Mondriaanhuis, a museum documenting the life and works of the Dutch painter Piet Mondriaan (1872-1944), a pioneer of modern art, often associated with the De Stijl [The Style] group whose members favoured cubic forms and sparse use of colors. The museum is located in the very house where Mondrian was born. On the first floor there is a faithful reconstruction of his humble apartment and atelier on the attic of a Parisian house. Even the background noises and fragments of songs from the roaring twenties add to the atmosphere, as if the painter could walk in here any moment. Apart from documenting the life and works of Mondriaan this museum has also space for exhibitions that show his impact on contemporary art. To be honest, the Mondriaanhuis does have only a few works by Mondriaan himself in its holdings. I use the Dutch spelling Mondriaan on purpose! Looking at the different approaches in these three museums is certainly interesting. At Museum Flehite there is much attention for the how of a reconstruction. At the old hospital there is a sharp contrast between the seemingly timeless space and the expectations of the last inhabitants about their new home. In the Mondriaanhuis the reconstruction of the attic in Paris evokes almost to perfection the surroundings of an artist in the world capital of art. Every approach has its values and shortcomings. I bring these museums together fully aware they cannot be compared completely at the same level, but any comparison goes faulty. We use metaphors from all kind of spheres of life together, often without noticing the funny effect of for example naval terms side by side with agricultural words. Has archaeology any uses for legal historians? I was hoping this question would show up here sooner or later. When reviewing in my mind the three museums at Amersfoort I would say that any discipline can be important, either on its own or more as a kind of handmaiden in the role of an auxiliary science. At Bordeaux a symposium will be held on February 8-10, 2017 concerning the theme (Re)lecture archéologique de la justice en Europe médiévale et moderne, “An archaeological (re-)reading of justice in medieval and Early Modern Europe”. There will be three main sections, one focusing on justice and space, another on justice and the body, and the third on objects associated with justice. The way archaeological approaches and methods used more commonly by legal historians can interact with each other will be explicitly addressed. The deadline of the call for papers is September 15, 2016. If you think you can convince scholars to use with great benefit the ways archaeologists approach the past, or make inversely them aware of the particular and fruitful ways legal historians work, you are most welcome. Hopefully this post helps you to consider the role of archaeology for legal history, not to solve just one cold case, but to gain perspectives on cases that might be closer connected than you can see at the surface. This entry was posted in Exhibitions and tagged Archaeology, Early Modern history, Legal history, Medieval history, Netherlands, Social history on September 3, 2016 by rechtsgeschiedenis.